If you're looking at a top-of-the-line 2008 Honda Accord EX-L V-6, you should be aware that the new 2009 Acura TL has similar mechanical underpinnings and an even more stylish package, for just a few thousand dollars more, and it brings the advantage of superior Acura dealership service. Whether you're looking for a comfy commuter in the $20,000 range or a luxurious, powerful $30,000 family sedan, the newly redesigned 2008 Honda Accord should be on your shortlist. 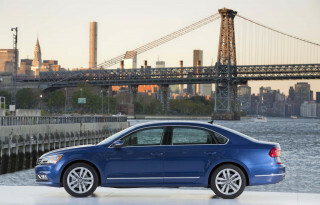 TheCarConnection.com has read the best reviews on the new 2008 Honda Accord to produce this comprehensive review. 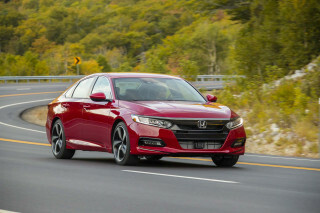 TheCarConnection.com's editors have also driven and evaluated the 2008 Honda Accord, and they used their impressions here to help differentiate the Accord from other sedans. The 2008 Honda Accord, which has been one of the best-selling mid-size sedans for many years, has been completely redesigned for 2008. It's slightly larger all around than the 2007 Accord, and it has bolder styling inside and out, as well as a roomier cabin that's notably taller. As before, the Accord has front-wheel drive and is powered by a choice of four- and six-cylinder engines. The Accord Hybrid, which was offered in previous model years, is no longer available. The four-cylinder models can be specified with a five-speed manual transmission; otherwise, both engines get a five-speed automatic. Many buyers will find the smooth 177-horsepower, 2.5-liter four-cylinder engine that's standard on the 2008 Honda Accord LX models perfectly adequate; the step-up 190-horsepower version on the EX models brings a little more pep to passing but doesn't have any additional oomph off the line. The especially refined V-6 makes the Accord feel like a luxury car, and it's the choice if you plan to haul around full loads of people and cargo or do much driving in the mountains. There actually isn't a big difference in fuel economy between the four-cylinder and V-6, with the four delivering up to 21 mpg city, 31 mpg highway, and the V-6 at 2 mpg less with both. The V-6 incorporates Variable Cylinder Management (VCM), which helps improve fuel economy. The Accord has a very settled ride that soaks up all but the biggest bumps, yet it has some level of sportiness when pushed hard into corners. The steering feels a bit heavy, but the 2008 Honda Accord handles confidently. Build quality is top-notch, with no creaks or rattles, and the swooping, dual-cockpit instrument panel is in a class above. The front seats are very supportive and comfortable, and the backseat has plenty of legroom, although headroom might be limited for some. Top EX-L models pack in the luxury features, including dual-zone climate control, leather upholstery, and a sound system with active noise cancellation; a navigation system is also available. Standard safety-minded features on the 2008 Honda Accord include electronic stability control, front side airbags, side curtain bags, and anti-lock brakes. The Accord performed very well, with top ratings in most crash tests, except for one hitch; in the federal government's side-impact test, an Accord sedan was given only three out of five stars--typically the lowest score awarded in the testing program. Regardless, the 2008 Honda Accord is an IIHS Top Safety Pick for 2008. The 2008 Honda Accord has a softer, more conservative appeal than its coupe cousin, but it’s still an attractive vehicle. 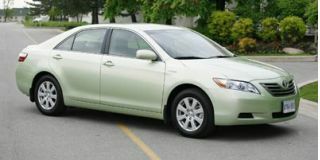 With few exceptions, TheCarConnection.com's experts note nothing but accolades for the 2008 Honda Accord's styling, though it suffers a bit when compared with its two-door kin. Car and Driver laments the loss of "the distinctive greenhouse shape and some of the edgy quality" this 2008 Honda shared with the coupe: "Honda, obviously, remains convinced sedans must offer a softer and gentler profile." Cars.com describes this 2008 Honda as "a bit anonymous from certain angles," adding that it is "as assertive as the coupe when viewed head-on, but it loses some presence as you move around to the sides and rear." On the other hand, Edmunds sings the Honda’s praises: its "eye-catching styling proves that reliable transportation doesn't have to be bland." According to Kelley Blue Book, "a bolder front end, deeper side sculpting and more pronounced fender flares give the all-new 2008 Honda Accord Sedan a crisper, more substantial look." There are some mixed reviews on the interior, which is noted by ConsumerGuide: "cabin impressions vary widely...woodgrain accents...go a long way toward creating a warm, upscale ambiance, [but] some testers found models without woodgrain trim lacked character." 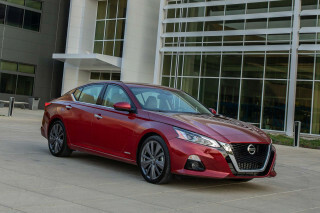 Cars.com opines that the Accord's "faux aluminum trim has a nice matte finish, but its appearance is not very convincing," while Edmunds considers the "overall design...simple, yet handsome." The 2008 Honda Accord offers a nice combination of sporty handling and a quiet, family-oriented ride. TheCarConnection.com notes few complaints about the 2008 Honda Accord's performance. Automobile reports that the 2008 Honda Accord Sedan's "powertrain hierarchy starts with a 177-hp four-cylinder and works up to a 190-hp engine...but the new 268-hp V-6 is the power champ by a wide margin." Car and Driver says this 2008 Honda "V-6 model will be the first Honda to offer the long-awaited, all-new i-VTEC V-6." Edmunds reports that this "wonderfully smooth and powerful 3.5-liter V6 is an excellent engine, producing strong acceleration and fuel economy," but notes that "the 190-hp four-cylinder provides more than enough motivation." ConsumerGuide, however, reports that "several 4-cylinder models tested have suffered from a rough idle and pronounced vibrations felt through the body and steering wheel." Nonetheless, Kelley Blue Book says that "in pulling away from a stop, plodding along in traffic and passing on the highway, the throttle responds to your right foot as if reading your mind, seamlessly delivering exactly as much or as little power as you want." Cars.com reports that with the 2008 Honda Accord, four-cylinder engines "can team with either a five-speed manual or a five-speed automatic transmission," but the "V-6 sedan is only available with a five-speed automatic." ConsumerGuide notes that "all manual-transmission Accords are faster than their automatic counterparts, with smooth clutch engagement and a precise feeling shifter." Edmunds reports that the 2008 Honda Accord's "fuel economy is very impressive. 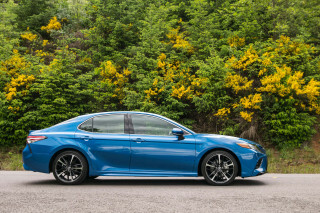 Both four-cylinder engines with automatic transmissions achieve 21 mpg city and 31 mpg highway, while the six-cylinder with the automatic gets 19 mpg city and 29 mpg highway." According to Car and Driver, this 2008 Honda V-6 model "will offer Honda's next generation of cylinder-deactivation technology to reduce emissions below the level of today's already squeaky-clean Accord while keeping Honda's CAFE rating at its near-30-mpg level." Steering the 2008 Honda Accord Sedan may take some getting used to, according to Automobile: "variable-ratio steering rack that offers nuanced responses just off-center but quickens the ratio near the ends of steering lock, to help you swing into parking spaces a bit quicker." This source also notes that "thanks to a standard strut-tower brace and reasonably stiff suspension, this car doesn't mind corners." Cars.com suggests that the Accord may offer the best of both worlds: "ride quality is an improvement over the outgoing model because it offers softer tuning that should appeal to more family-sedan buyers while still delivering the sporty driving feel the car is known for." Edmunds refers to this as well, saying the Accord’s suspension has a "balanced approach to handling and ride comfort...[maintaining a] traditional mix of both sporty handling and comfort." When it comes to stopping power, "braking feel, response and feedback are also top-notch," according to Kelley Blue Book. 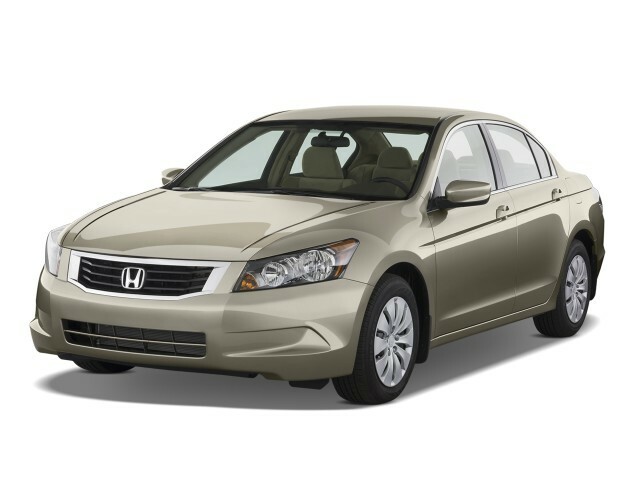 The 2008 Honda Accord provides high levels of comfort, and quality materials and assembly abound inside. TheCarConnection.com's experts noted a great deal of positive comments concerning the fit and quality of the 2008 Honda Accord's interior—and found much to praise in firsthand driving experience, too. ConsumerGuide says that "seats have grown for 2008 and are more comfortable as a result...sedans have good headroom, vast legroom, and comfortable seats...[while] larger door openings and a higher roof contribute to easy entry and exit." Mother Proof, on the other hand, says that the "seats are a bit hard." 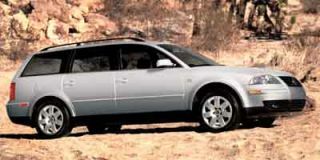 Nonetheless, Edmunds reports "an ample supply of front and rear passenger room" inside the 2008 Honda Accord Sedan. Kelley Blue Book says that there is "an interior volume increase big enough to move the Accord into the EPA's Large Sedan category, [providing] room for wider seats and a big, two-arm center console." The 2008 Honda Accord Sedan is not stingy on cargo space either, at least for its class. Mother Proof reports that "the rear seats do fold down, through a lever found in the trunk," providing "14 cubic feet of trunk space, which is at least a cube less than its major competitors," as stated by Edmunds. ConsumerGuide describes this 2008 Honda trunk as "large, deep [and] usefully shaped," while noting that "a smallish opening may prevent loading of bulkier items" and "intrusive hinges force cautious loading of crushable items." Kelley Blue Book assures buyers that "there are plenty of bins and cubbies throughout and the backseat and trunk qualify as roomy in every dimension." Materials are definitely upscale, according to Mother Proof, which says that the 2008 Honda Accord Sedan's available "leather interior has a sophisticated, tailored look and feel." Cars.com is of similar opinion, stating the "new [2008 Honda] Accord's cabin treads ever-closer to the domain of Honda's luxury brand, Acura, with its use of high-quality materials, good fit and finish." While this 2008 Honda is "quieter thanks to additional sound-deadening materials and body-stiffening measures" according to Edmunds, ConsumerGuide reports that "road noise is fairly pronounced, with less sound isolation from traffic din than might be expected." The rear side impact rating is a concern, but occupants are safer in a 2008 Honda Accord than in many other vehicles. As is the case for most Hondas, the 2008 Honda Accord provides excellent levels of safety. "On the bright side, the Insurance Institute for Highway Safety rated the Accord Good--its highest rating--all around in crash tests," reports Mother Proof, adding that the 2008 Honda Accord Sedan "is an IIHS Top Safety Pick." This is significant, because IIHS standards are particularly stringent. According to Car and Driver, the 2008 Honda's "body structure...utilizes Honda's 'Advanced Compatibility Engineering' designed to better disperse energy upon impact in a frontal collision, which essentially means occupants are better protected if encased in the eighth-generation Accord." Cars.com reports that the 2008 Honda Accord is equipped with "six airbags, including side-impact airbags for the front seats and side curtain airbags," as well as "Honda's Vehicle Stability Assist electronic stability system, all-disc antilock brakes and active front head restraints"--all standard equipment. Nonetheless, the National Highway Traffic Safety Administration (NHTSA) gave the 2008 Honda Accord Sedan only three stars for rear side impacts—but awarded it five stars in all other tests. ConsumerGuide reports that "visibility is good all around in all models" of the 2008 Honda. The 2008 Honda Accord offers a wide range of features, including Bluetooth, a navigation system, and real-time traffic information via satellite radio. TheCarConnection.com's editors note a plethora of features available for the 2008 Honda Accord. According to Edmunds, "the [2008 Honda Accord] comes in LX, LX-P, EX and EX-L trim levels." Automobile says that the 2008 Honda is "designed to recruit younger buyers into the Accord fold, and it's aiming at that crowd with a mix of high-tech features." Some of these, according to Edmunds, include "keyless entry, full power accessories, cruise control, a tilt-telescoping steering wheel, fold-down rear seats and a six-speaker stereo with a single CD/MP3 player and an auxiliary audio jack" for the base LX trim. Higher-level trims for the 2008 Honda Accord Sedan include goodies such as alloy wheels, auto up-down front windows, and a power driver seat. The top-of-the-line EX-L trim "adds leather upholstery, auto-on headlights, dual-zone automatic climate control, leather-wrapped steering wheel, heated front seats...satellite radio...[and a] premium stereo system," Edmunds adds. By the time one reaches the 2008 Honda Accord Sedan's EX-L trim, nearly every option is included. "The lone option is a navigation system available on the EX-L trim level that includes voice-activated controls and Bluetooth" according to Edmunds, with Kelley Blue Book reporting that the 2008 Honda's "intuitive DVD-based navigation system--featuring an 8-inch screen and Zagat restaurant ratings--is further enhanced by an accurate and easy-to-use voice-recognition system." Cars has 260,000 miles. Still drives excellent. Exterior paint is horrible. RELIABLE VEHICLE AND NO REGRETS I BOUGHT IT. GOOD STYLE WITH DESIGN AND NICE ECONOMY. Good To Me Except For CD Player 1 CD Is Stuck In It And Will Not Come Out Any Help. Brake problems began within days of purchasing this Accord in March 2008. Rotors warped, pads wore out within 10,000 miles. . .even rear rotors and pads required replacement at 11K! Brake pedal feel was poor... Brake problems began within days of purchasing this Accord in March 2008. Rotors warped, pads wore out within 10,000 miles. . .even rear rotors and pads required replacement at 11K! Brake pedal feel was poor as well and brake fade bordered on deadly. Transmission shifting was sluggish, front seat leather showed wear almost immediately and the rear suspension was significantly underdamped, resulting in an "interesting" pogoing effect on Southern California freeways. Finally, the front seat leather was shot within 3 years! Aftermarket (StopTech) rotors, pads and brake lines solved the braking problems, aftermarket coilovers resolved the suspension issues, flushing the transmission with a revised Honda AT fluid and fighting with Honda CR finally resulted in an acknowledgement that the seat leather tanning/dyeing process was defective, resulting in replacement of the front seat covers. The 2008 Honda Accord is a wonderful car. 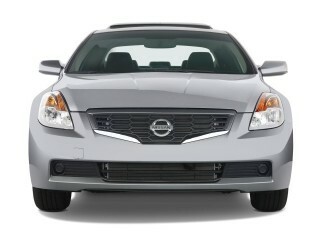 Great gas mileage,nice and roomy plenty of cargo space. Looking for a different year of the Honda Accord Sedan?